MARBLE FALLS — It wasn't supposed to be this way when Virgil Belk stepped onto his lawn around Thanksgiving in 2009. "I just asked him to string some lights," said his wife, Brenda. "And, well, this is what I got." "This" is a Christmas lights display that erupts with music and style. Virgil tied the thousands of lights, three or four mega-trees, four archways, dangling snowflakes, and countless other pieces to music through a computer program. Each beat of music — from a number of songs — elicits a different effect. "Yeah, I'm a bit obsessive," Belk said. He programmed each of the songs, motions, and displays when he first created the Christmas wonderland at the couple's home at 205 Sixth St. in Marble Falls. Now, Belk adds a few things each year, though he laughed when he considered the big question: "Why?" "I don't know," he said as he moved among the cords, light strands, and displays he set up Thanksgiving eve. 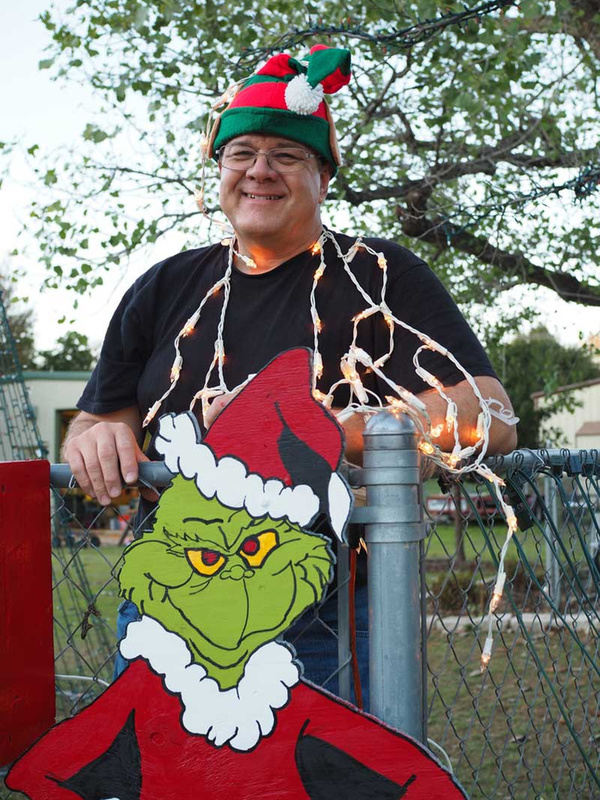 Though he often exhibits a Grinch-like personality, clearly no Grinch would tackle such a project year in and year out. Then, he smiled a little as he pointed to the wooden stockings hung on the house eves. Each one bears the name of someone in the family, including grandchildren. Brenda even created a wooden snowman that hangs on the wall near the stockings. The lights display runs nightly through New Year's Day. The Belks will gladly accept non-perishable food items that will be donated to The Helping Center of Marble Falls, a local food pantry. "Well, I do enjoy it," Belk said referring to creating the display and the reaction of people who come by. And if you do stop by, tune into Grinch Radio (look for the radio frequency on the sign) and enjoy the show.